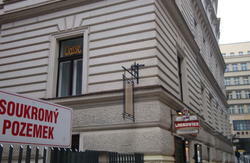 Small family run hostel in the center of Prague. Please confirm your check in time with us . We require a minimum stay of 3 nights during the New Year holiday. 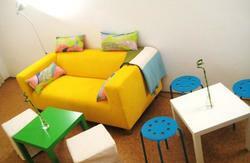 Hostel Le Papillon has a total capacity of 30 people with various types of lodging. It is very convenient for those who wish to sightsee in Prague. Or if you wish to travel throughout the Czech Republic throughout the day and come back to the hostel at night this is no problem with bus and rail stations located nearby. Accommodation is mainly dorm style where you will be sharing a large room with other tourists who are also fond of this type of accommodation. We also have double and triple rooms. Our price is remarkably cheaper when compared with hotel prices but the service is hotel standard. Apart from your room facilities you are welcome to use our parlour with TV, bathroom with shower, kitchen with refrigerator, hot-plate cooker, coffee-maker, washing machine and iron. We also offer: car parking in the garage (450,-per 24 houres)- free luggage room - safe (as well as safety boxes) - fully equipped kitchen - lockers - TV - internet-wifi-NO CURFEW. Please note reception is open daily from 9.30am until 6.00pm. From Wilson (Main) Railway-Station : Opletalova St. to Wenceslas Square. From the middle of the Wenceslas Sq. to Vodickova St. (you can take tram from there.) Second St. to the right is Jungmannova. Second option is through Jeruzalem St. Tram stop Jindissk. Nos. 3,9 or 24 to tram stop Vodikova. First street to the right is Jungmannova. From Railway-Station Holesovice: Metro line C to Muzeum. From Museum down to Wenceslas Sq. Vodikova Str. (tram). Second str. From Wenceslas Sq. : Vodickova Str. (tram), second str. to the right is Jungmannova.